From the hockey rink to the bodybuilding stage, this investment banker sought a strong and confident body! After playing Division 1 hockey in college, I graduated and took a job as an analyst with an investment bank. Working long hours and being on the phone or computer all day was a tough transition, but after leaving the office, going to the gym and getting a good workout in helped break up the monotony of my days. After college, I trained rather casually and had a relatively loose diet for about a year and a half. Luckily, I started hanging out with some of the bodybuilders in my gym, and, at that point, I knew I wanted to not only look like them, but I wanted to adopt that way of life. I missed competing as a hockey player, and I knew the intense training and lifestyle of bodybuilding would be a perfect opportunity for me to compete again. For me, the best part of bodybuilding isn't the ten minutes on stage (although, stepping into the spotlight is definitely exhilarating), it's the elevated intensity of the training sessions, education of human physiology, mental strength that you develop and personal confidence that accumulates as you see your body change and you accomplish your goals. These are all aspects of bodybuilding that transcend the sport and help me in every area of my life. Bodybuilding is the only sport you get to "take with you" every time you walk out of the gym. It's amazing the confidence you have every time you walk into a room or the respect you gain as people watch you transform your physique. Eventually, I found a trainer about 20 minutes from my home who had more than 30 years of experience. As a former highly-ranked national level bodybuilder and powerlifter, he not only had the "book knowledge" that comes with 30 years of training, but he had the experience and knew what it would take for me to accomplish my goals as he had accomplished them himself. We sat down and pulled out the 2010 NPC calendar and circled two shows that were about nine months away. At that point, he got my diet and training on track. If you have the luxury of working with a good, qualified trainer, I highly recommend it. Human physiology is one of those things where you don't really know what you don't know. While working with such an experienced professional, I was able to learn an incredible amount of information about training and proper nutrition to fuel my muscle growth. Outside of textbook knowledge, my trainer put me through intense workouts that were efficient and pushed me to my physical limits. In just a few short months, I saw a tremendous increase in muscle mass and strength. When it came time to get lean for my first show, he was able to take me step-by-step through the process in order to maximize muscle retention while shredding off body fat. 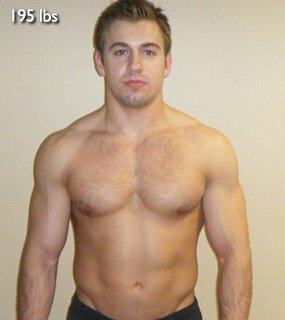 If you don't have access to a trainer, Bodybuilding.com is full of informational articles from great authors. I've also found YouTube to be an excellent resource. Spot the fat, win a prize! My diet stays about the same except I'll add more good sources of fats (whole eggs, tuna, red meat, natural peanut butter, and avocados). I'll also bring up my portion sizes a tad to support muscle growth, add a casein protein shake before bed, and allow myself a cheat meal once or twice a week (usually pizza, Chinese food or something to satisfy my carb cravings). I still remember the first thing my trainer told me during our first workout: "Put some candles around the squat rack because that is your new altar." If you want to transform your body, you need to simulate it in order to elicit a response (muscle growth and strength). There is no greater stimulus you can create than putting several hundred pounds on your back and making it move. The same goes for deadlifts. These two exercises activate virtually every muscle in the body, and along with incline press movements to develop my upper chest, they were the staples of my workouts. There is no doubt, if you want to add a significant amount of muscle to your frame, you need to incorporate these two exercises into your training. There is no better feeling than limping off the squat rack, sucking air, seeing stars and stumbling to the closest chair. I might come in and do some extra ab or calf work. Or if I feel I need to bring up a particular muscle group to improve my symmetry, I'll do a little extra to target that area. I'll usually incorporate 2-3 ab sessions of about 10-15 minutes throughout the week. During the off-season/muscle growth phase of my training, I try to limit my cardio to ensure that calories are being used to fuel muscle growth. When I'm prepping for a competition or photo shoot, I incorporate 45 min of steady state cardio every morning on an empty stomach. I usually put the treadmill on an incline of 3-4% and walk at about 3.2-3.5mph. Have specific, measurable goals. Whether it's to lose 10 pounds, increase your bench press 20%, or a particular placement in a contest, I found having a specific goal to strive for helps provide a higher level of motivation and focus as you train day in and day out. Once you establish your goals, put together a detailed timeline and game plan in order to achieve them. Seek out the advice of others who have accomplished what you have accomplished. The knowledge they've accumulated from their experience can be a huge asset to you. If you want to see significant changes in your physique, it's imperative that your training sessions be focused, efficient and intense. Otherwise, your body won't be forced to adapt. You're not there to chat, you're there to improve yourself. Turn up your headphones, put your hat low, and get after it. If you're looking for a place to hang out, I'm sure there's a Starbucks right around the corner. Commit to your goal. When I told people I was training for my first bodybuilding competition, I got a lot of smirks and sarcastic comments. Don't let comments like these deter you from bettering yourself. Funny thing is, a year later, these were the same people asking "what my secret is." There is no secret - only commitment. Following up from the above point, whether it's bodybuilding, starting a business or anything else for that matter, making a drastic improvement in your life takes a huge amount of determination, mental toughness, hard work and patience. These are all personal qualities that a lot of people lack. At the end of the day, commitment feels so good. When they see you doing what it takes to become a better version of yourself, they realize they're not willing to do the same. As a result, they'll throw negativity your way via smirks, chuckles or, my personal favorite, "why do you want to be the best at exercising" remarks. I've learned it's not worth explaining yourself to people like these. Besides, while you're in the gym getting stronger, faster and leaner, they're opening another box of Pringles, cracking open their third bottle of Pepsi, and mindlessly flipping through HBO re-runs. Who cares what they think? I found the negativity to be an incredibly motivating tool for days when I don't feel like going to the gym or especially when I'm trying to grind out an extra rep or two during an intense set. Let people try to drag you down; I honestly feel it's a blessing in disguise. There is no better satisfaction seeing these people after you've accomplished your goal. Make sure you give 'em a quick wink and a thank you.